Why Buy an Expensive Bicycle? The two “randonneur” bikes above look roughly similar. Both have a front rack and both have gears. Yet the one on the right would cost more than five times as much as the one on the left, if you ordered one today. Of course, there are obvious differences: One already is equipped with lighting and fenders, the other isn’t. But even if we add $500 for those parts to the bike on the left, we still have a remarkable difference in price. Why is the bike on the right so much more expensive? The bike on the left is a mass-produced machine, whereas the bike on the right was hand-made by a small constructeur. The “cachet” of a handmade product is nice and well, but what do you get with the hand-made machine that the mass-produced bike does not offer? 1. Performance: The high-end bike has a geometry carefully conceived for its intended purpose. (The production bike typically is a standard “road” bike, to which a rack has been added.) For the custom bike, the tubing was chosen to offer the ultimate performance for its rider. The fork blades are thin and absorb shock better. The rack sits lower and is stiffer, so the load works in unison with the steering. The fenders attach to precisely located bridges without spacers, so they are less likely to rattle or resonate. The high-end components work flawlessly. The cranks offer narrow tread and exactly the chainring choices the rider needs. The end result is a bike that handles better, climbs better, descends better and is less fatiguing to ride. 2. Durability: The hand-made bike has each tube carefully mitered. The best hand-made bikes are brazed by master craftsmen who knows their craft. You can be sure that there is braze in every joint, and that the frame will not fail prematurely. The bearings of the components are precision-ground, so they will last multiple times as long as those of a less expensive bike. The cranks are forged and thus stronger and more durable. Even the paint is more durable, because it has been applied over a primer coat, and then been baked and cured. On the inexpensive production bike, the quality of construction simply is not the same. Every part of the bike is spec’d to the lowest cost, rather than the highest quality. This starts with the tubing, and continues to even the smallest screw. Depending on how much you ride, the production bike can be adequate, or it can be frustrating as parts wear out and have to be replaced. 3. Aesthetics: The careful construction of the handmade bike also shows in its appearance. The fork has a gentle curve rather than a dog-leg bend in the middle. The lugs are crisply filed. The rack sits in exactly the right place on top of the front wheel. The fenders follow the curve of the wheels. The components are polished rather than powdercoated. A bike like this is a joy to behold, and it will age well. Do you deserve a better bike? The question for most riders is whether all this makes enough of a difference to warrant the extra expense. I believe this depends on how much you plan to ride the bike. If the bike is to serve for occasional rides, then the production bike may be all you need. But if you plan to ride more often and longer distances, you soon will appreciate the performance and durability of an excellent bicycle. Even the appearance is important: A beautiful bike will beckon you to ride more often. The initial investment may seem high, but the better bike will be less expensive in the long run. Not only will its quality components last longer and require less maintenance, but you also will be less tempted to upgrade to a “better” bike. In the end, every cyclist chooses for him/herself where they are willing to make compromises. Some don’t care much about aesthetics, others don’t need speed. Knowing what the trade-offs are allows you to make an informed choice. 116 Responses to Why Buy an Expensive Bicycle? My question is there anything that splits the difference. Can you get 80%-90% of the custom bike withou going full-on custom? Why can’t geometry and components be selected such that a production bicycle can provide all but the last 10% you get from a custom ride? I bought a Box Dog Pelican in June 2011 for $1160 frame/fork (price has since been increased to $1400). I have been very happy with it and it includes many features that I would have specced for a custom bicycle including dynamo wiring braze-ons on the fork and lots of clearance for wide tires and fenders. The frame is TIG welded, but in a elegant way that does not diminish the appearance to my eye. It certainly is not a show bike, but that frees me from fear of paint nicks or wear and tear. I have never ridden a custom bike designed just for me, but the Pelican certainly feels high performance. It seems like in this case a production bike can offer 90% of what you might get with a full custom rando bike. In a way, this is a trick question. Jan’s talking about a particularly rare type of bike here, with very few production choices. If we change the focus to racing bikes aka “road” bikes, I think the picture changes radically. Every bike shop’s full of excellent choices, and even top shelf customs are hard-put to offer better performance, although depending on how you feel about the look of today’s road bikes, they may offer better aesthetics and fit. Also, “production” may not be the best way to characterize bikes like the Box Dog Pelican, which is hand-made in very small batches by a well-regarded custom builder, or the Boulder, which can be had with full custom geometry and is made to order, one at a time. The topic applies just as well to more common bikes. A Surly LHT will not offer the same performance, durability and enjoyment as an excellent hand-made touring bike. A $1500 racing bike will not perform like a $5000 one, and the difference is not just a few pounds in weight. Having ridden a $1500 Trek 2100C and a $4000 (?) Trek Madone, I can tell you that there is a world of difference between the two. I only chose randonneur bikes, because I had the photos of the high-end bikes handy. The last line is the truest. That frame failure is quite severe. The logo appears to be from a Kogswell. And from the color, I’m guessing a “Model P” (not the P/R). One of the strongest reasons steel is touted is durability, but that failure resembles the way that CF fails! It appears to be a tubing defect. I think the bike was a repaint. The owner likes the bike, so they had the broken tube replaced. The builder reported that there wasn’t much braze in the joint between down tube and BB shell. 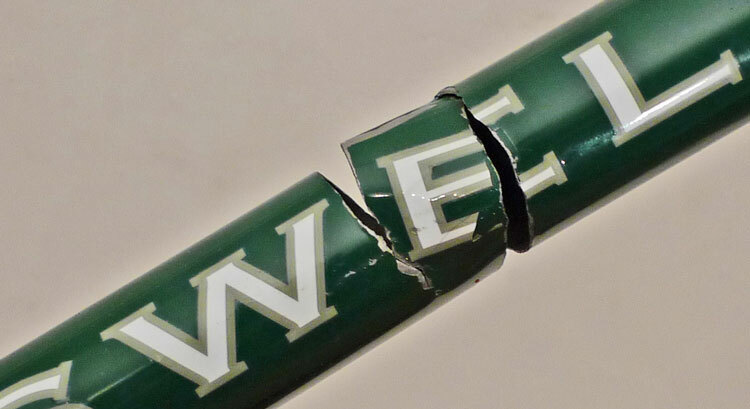 So if the tube hadn’t failed, the joint probably would not have lasted very long, either. It’s not particular to this (now-defunct) brand – many other Taiwanese frames are made in the same factory. I’ve cracked three older production lugged frames in the bottom bracket. All where the seat tube meets the bracket. I am a pretty big guy, but I’m pretty leery of old lugged frames now. My guess is that they were not well brazed down there, leading to a lot of flex when riding hard. Alas, I’m one of those still “saving pennies” for a Boulder (at least) or similar to replace my Kogswell Model-P, which I recognize in the frame failure photo. It’s foolish for me to suddenly be concerned about one of my own tubes shearing open with all the variables at play, but that’s precisely the point I gathered from the post: better builds eliminate variables. Admittedly, the photo did give me pause and an anxious feeling about my own Model-P, but it’s been a good bike to me since ’06, despite some initial issues. I see myself in that “grey area” where-in the builder tried to offer the best of lugs, the best of steel, and great rando-worthy features… but at a lower price point. When “graduating” from my late 90’s Schwinn ‘Passage’ aluminum road bike after a few fledgling brevet attempts, I knew precisely what I wanted – but couldn’t afford it – and Kogswell met me at that intersection. I imagine I’ll be rewarded in more ways than simply a notion of increased strength once I “cross over”. I didn’t mean to imply that all Kogswells somehow are going to break. They are no different from the other bikes made in the same factories. In any case, a down tube failure rarely is catastrophic. You still have a top tube holding things (more or less) together. Wouldn’t you say that the damage on the Kogswell is quite centrally located on the downtube to be a brazing failure? Common framebuilding knowledge would seem to point to improper heat treating, a tube drawn too thin in the center between the butting, or a combination of the two. I’m still quite shocked at it; really wouldn’t have expected it (though I’m more accustomed to non-heat treated frames – the only heat-treated frames I’ve ridden and examined in detail are the same two Terrafermas that you rode for the BQ reviews). P.S. : Correction – it was not the Super Rando that I tested, but another later rando build. I agree, the failure has nothing to do with brazing. It appears to be a defective tube. However, when the tube was replaced, the builder who did the repair also found a lack of brazing in the BB/down tube joint. No worries – no such implication taken: It’s understood as a production thing, not a brand thing, absolutely. Quality and Craftsmanship cost money . Period ! Yes a production bike will do and is in fact a whole lot better than no bike at all , but if you can go the extra dollars ( and there are some ‘ reasonably ‘ priced custom builts available ) and can get you head around that being perhaps the last bike you’ll ever need , its worth it to go custom . Is it better to buy one , pricey , custom built bicycle that will suit all ones needs , or to buy several cheaper ‘ production ‘ bikes , for each and every specific need ? For me, no production bike can even do what I need. I need two bikes: My Urban Bike to carry a lot in town, and my fast randonneur bike. Neither of those are available ready-made. Moulton ! Nuff said ! One bike that truly does it all , and in most cases better than the so called ‘ specialist ‘ bikes made . Load em up and do the errands . Strip em back and run down/embarrass the heck out the the Carbon Fiber crowd ( ” that thing passed me like I was standing still ” being the usual comment when they catch up with you at the rest stop ) and all while losing some 40% of the fatigue ‘ normal ‘ bikes deliver due to road shock etc . Expensive ? Why yes it is . Worth the price of entry ? Well for me at least yes . I get all I want or need from a bike while not getting the usual five hours after of numb hands even the most properly fitted , high quality bikes deliver . And in my profession ( moniker is the clue ) that one little aspect is critical . Though it is also a riot to blow by some Racer WannaBe on his/her $10,000 CF High tech Wunderbike on a Moulton as well . I am glad you enjoy your Moulton so much. We tested a Moulton in Vol. 9, No. 1. We also published an old article from Le Cycle about the Moulton, as well as a review of Alex Moulton’s autobiography. I understand that the Moulton has a cult following, and it is a very appealing machine with its spaceframe and radically different design. As for its performance, at least for us, it did not work all that well. We still have an open invitation to the U.S. importer to send us somebody who can make a Moulton fly. We don’t expect them to beat us, but at least show some promise and do better than we did on the machine. Do you ever come to Seattle? It would be fun to go on a ride and see how a Moulton performs under a strong rider who really likes the bike. I own an earlier model of the Salsa picture (2008) and have been quite happy with it. 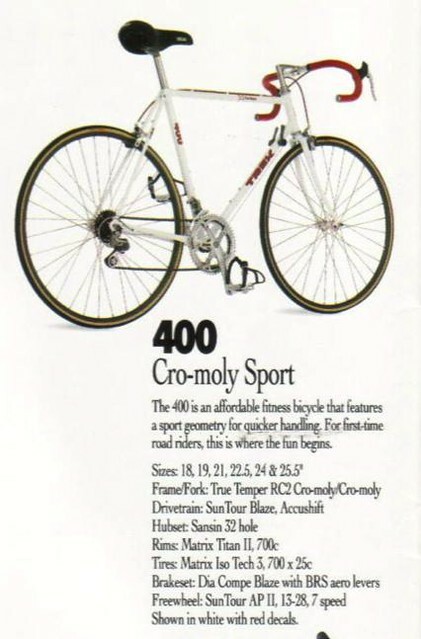 In that year, the bike came with primarily Shimano 105 components and plastic fenders and no front rack. I ride about 2,000 miles a year and haven’t replaced anything but the original chain. The performance seems acceptable to me, but I’m not a particularly strong rider, nor do I have experience with more expensive bicycles outside of test rides. How far would I need to ride on individual rides or monthly annual mileage to notice the performance and durability differences you mention? I think it is also fair to note that to many people, especially new or younger cyclists the Salsa *is* an expensive bicycle. I am glad you enjoy your Salsa so much. It’s a good bike. I only chose it for the comparison because the latest versions have a front rack. When does the benefit of a high-end bike begin to accrue? That depends a lot, but for me, when I finally got a high-end bike, I couldn’t help but think: “I wish I had done that earlier.” This was the case for my first Bianchi racing bike, then for my Grand Bois Urban Bike (instead of toting Burley trailers all over town! ), and most recently for my 650B randonneur bike. Is it actually the case that handmade bicycle frames are more durable? So if you took a 1000 Bruce Gordon touring frames and say … a 1000 Surly LHTs that the failure rate of the LHT would be significantly different? It seems that with a lot of other products, moving to mass production often reduces error rates per item. With mass produced bicycle frames, I’d expect durability to increase with cost — the quality of materials and QC — at a decreasing rate. Essentially one would have to compare the master frame builder to the effect of specialization. Of course, I don’t know what the production line of say Surly LHTs looks like. Perhaps there is little specialization. As you point out, there are advantages to mass production. For example, a bicycle chain is mass produced to much closer tolerances than a builder could make by hand. Mass production is the better option – in fact, it’s the only option. However, inexpensive bicycles are not mass-produced by high-tech robots who put clearly defined spot welds exactly where they should go. Production frames are produced in batches by workers whose main goal is to reduce cost, i. e., the time spent on each frame. Matthew Grimm of Kogswell told me how the Taiwanese frame shops proudly told him that they could make a frame in less time than their next competitor. When he asked whether they could spend a little more time and make them a little better, it seemed that he was the first to ask that question. Every other company was just looking for the lowest price. Similarly, the IRD freewheels were assembled by workers who never had worked in mechanical jobs before. They did not know how to adjust a bearing. The same cause probably is the reason why Shimano’s generator hubs tend to have their bearings adjusted too tightly straight out of the box. In the end, you are comparing “hand-made” frames and parts that are made roughly the same way, but one is intended to be as cheap as possible, the other as good as possible. So to answer your question, per mile ridden, production frames appear to have a much higher failure rate than hand-made bikes made by the best builders. Is there data to supporting that statement? I’ve only ever seen one frame fail, and that was from extensive use of a trailer pulling on the chainstays. I’ve heard of many steel frames failing, but not sure if those were custom or not. We do have a handle on the failure rate of individual builders. For example, Cycles Alex Singer has made 3500 bikes since 1938. They have had failures, but generally not before a bike has been ridden more than 100,000 miles. Similarly, talking to Peter Weigle, who has been building for more than 35 years, he told me of a few failures during his early years when he was learning his craft, but very, very few since then. Of course, there are many more production bikes out there, so you would expect more failures in total. Even so, I know plenty of people who broke their low-end production bikes early into their cycling, with relatively low mileages. Since then, they have ridden harder and further on their high-end bikes without problems. For these individual riders, the statement also holds. Of course, barring a scientific study, one has to be careful, which is why I inserted the “appears” into the statement above. Finally, you’d expect a bike with a partially brazed lug, or with a tube extruded over an imperfect mandrel, to have a higher failure rate than a bike where every precaution was taken. For components, you would expect a precision-ground bearing with proper seals to last longer than a roughly-made bearing that is exposed to the elements. Agreed, but the probability this occurs to a custom builder or a factory are equal. 1. A partially braze lug is the frame builders snafu, and what precautions can you take other than his reputation & hoping he did not have a bad day. Do you radiography the as built joints to ensure full penetration? I seriously doubt it. 2. An imperfect mandrel is the tube manufacturers snafu and you or your builder have absolutely NO defense against this unless you or him eddy current test 100% of the tubes to ensure no tube defect exists. I doubt you or him would do it. You& him totally rely on fact or premise the tube manufacturer is reputable. Your only defense to the the claim the your custom frame has a lower failure or is immune to failure than a production frame is the builders reputation. Why don’t you just state this is you personnel judgement rather than use a smoke and mirrors argument. You make some good points. Skill levels can vary. There are some custom builders out there whose skills may not be great. However, it seems silly to argue that cost cutting does not affect quality. If a Taiwanese frame shop told their employees to take all the time they need, and just pass the extra on to the bike makers who order the frames, they no longer would have orders. So even if the inexperienced labor in the production shop had the same skills as a master builder, they would not be allowed the time to do the job properly. If you were to cut apart 100 mass-produced production bikes and 100 Peter Weigles, I bet that you’d find a lot of voids in the lugs in the former group, and very few, if any, in the latter group. In fact, all the builders who do repairs confirm this. This always has been the case, whether it was 1970s Peugeots, Motobecanes and Raleighs or today’s bikes made in Taiwan and China. Hell, plenty of beloved japanese bikes (including beloved RB-1s) were brazed without mitering the tubing at all! That’s true of Maxway and friends making small batches of steel frames, but absolutely not the case for Kinesis, Merida, etc. making 100x that many aluminum frames! The vast majority of inexpensive bikes have their aluminum tubes automatically hydroformed and mitered, placed in a jigs by a human, then welded by an industrial robot. You’d have to be Dario Pegoretti to possibly match their extraordinarily low defect rate. Fred, you are right about the inexpensive aluminum bikes being mass-produced in semi-automated settings. I was thinking of the production steel bikes that are popular among our readers. A good friend’s Polish father once, brilliantly, told him “You are too poor to buy cheap things.” I’ve absolutely found that to be true for me. A cheap thing breaks, wears out, and generally doesn’t suit the purpose as well, such that you end up buying the same thing twice, and spending more than you would have to buy the durable thing in the first place–and you’ve spent all that time experiencing a cheap thing instead of the pleasure of something well-designed and made! (The corollary of the first homily is “If you buy cheap things, you own cheap things.”) Mind you, with the difference in price between those two bikes you could buy the cheap one five times….! Don’t you think though, that before you can responsibly choose the features and components of a custom bike you have to have enough experience to know exactly what will suit you? I wouldn’t feel comfortable ordering up my dream bike without having first tried out 650b on my Rivendell Saluki, and a low trail fork on a Rawland rSogn, for example. You make a good point. Indeed, I often recommend that new cyclists buy used bikes to try different things. If you buy used, you usually can sell for what you paid (more or less), so you can experiment without spending much money. But once you know what you want, the high-quality bike is a worth while investment. I was wondering, you haven’t mention the Terraferma Corsa 650B when making comparison to production bikes for a while, has this bike fell out of favor since your review of the 650B? Does the Corsa 650B still rate up there with the Boulder or even the more expensive Rene’ Herse in the area of performance? Mike Terraferma builds custom bikes. He is a great guy, and he deserves credit for introducing us frames made from to superlight, standard-diameter tubing. You can read about that “eye-opener” here. Our test bike was bought by a friend, who rode it in PBP last year, and continues to use it daily on his commute in Seattle. I am curious. Do you consider Rivendell bikes, which are “production bikes” ( although a little more expensive than the Salsa you pictured) to be “production” bikes which are inferior to the handbuilt constructeur bikes you prize? Do you consider the Madone to be an inferior “production” bike? Seems to me that there are several high quality “production” bikes built by companies that stand behind their product and give back to cycling as much, if not more, than the handbuilt bike crowd. Therefore, I really question the blanket assertion that expensive custom is always better. I bought one of the first Homer Hilsen’s Riv made. It was a great looking bike and performed very well. Ahearne made a nice front rack for the bike. Nice as it was, the stays were not optimally located as the mount points had to be worked to fit the bike rather than vice versa. The AHH does not have built in accomodations for dynamo lighting so I used battery lights. If I had gone with dynamo lighting, I would have had to tape the rear light wiring to the bike tubing. Along with being unsightly, there is certainly more risk I would have managed to sever the wiring while riding or moving the bike. Mounting aluminum fenders was an ordeal, with many modifications necessary to keep rattles at a minimum and to get the proper lines. Finally, while this might not be the case for every custom builder, the Coast frame and fork cost only $500.00 more than a new Hilsen. I really do not understand what you mean by ‘giving back to cycling.’ I like Grant, follow his Blug and buy components and clothes from Rivendell. But does he have any sort of special claim to giving to cycling that builders like Peter Weigle, Tom Kellogg, or even Johnny Coast do not? Interesting topic. Totally agree that extremely well-designed and well-built bicycles are worth the (much) higher cost, but I think quality can be more complex that just custom vrs production, even with frames. I’ve owned a small number of custom frames which were certainly well-intended efforts, but which didn’t really hit the mark. There are any number of small customer builders who lack design and engineering expertise, and/or who build frames in such small numbers that their designs haven’t been through sufficient cycles of refinement to become extraordinary. The bike buyer risks merely funding an R&D effort that isn’t really there yet. Likewise, I’ve owned a number of production frames which were apparently built in sufficient numbers to have refined out the kinks and that truly have worked well. This seems to be especially true for Ti production frames maybe more than for steel. I’ve had a number of Ti production bikes that I’ve preferred over any custom steel frame I’ve owned, and that certainly perform as least as well or better. Finally, if one’s body type falls squarely in the middle of the bell curve on body type variance, the standard frame geometry on even fairly inexpensive production frames can work pretty well. This may be more true lately than it was even ten years ago. Jan, as I recall, you observed in your review of the Surly LHT that if such a bike existed when you first got into long distance riding, you might very well have been content NOT to go custom. As you point out, a high-end production bike can offer great quality. A poorly made custom bike can be less than satisfactory. As the title of the post (“Why Buy an Expensive Bicycle”) infers, I was talking about why expensive high-end bikes offer better performance, durability and aesthetics than budget offerings. I only mentioned custom vs. production bikes so I could compare the two bikes shown without naming names. I did not mean to infer that custom bikes are inherently superior to production bikes. Your memory of the Surly LHT review isn’t quite correct. I wrote that the Surly, as tested, offered better performance due to its design (mostly because the Tubus racks being far better than the Blackburns on my old custom bikes). I did not talk about quality or longevity in that comparison. In fact, the Tubus vs. Blackburn racks also shows that the high-end components offer a significantly better riding experience. A contributor to a tandem forum I visit once wrote that after decades of riding tandems he can say they enjoyed riding their old 60 lb Schwinn Twin at least as much as their newest carbon fiber tandem. We all ride for the enjoyment of it and it is the ride and the company we keep that makes it fun. I have spend a lot of time and effort finding the type of bike I like but it is almost a separate hobby from riding. The machine, like a good pair of bike shorts, is important but not the main reason for the ride. I know what type of bike I enjoy most, but I also know I would ride almost anything in order to ride. This is something that I have been pondering for a while now, but how it practically works out is baffles me. I agree wholeheartedly with Jan’s ideal and have tried to live a lifestyle of fewer higher-quality things that last and can be repaired. In many ways I have tried to live this out since I graduated from college. I’m 27, have been biking as primary transport since 2006 and live in NYC. I have figured out that I can spend/save approximately $200-300 per month on bicycle transport, repair and recreation. I have 2 bikes, a 1980 Schwinn LeTour with a few upgrades to make it stronger, lighter and a bit nicer. And a Riv Quickbeam with a dynohub, front rack and fenders. I really want to make the Quickbeam into a low trail porteur and get a custom Rando bike. I rode 7500K or so doing transport cycling in 2011, mostly on the Quickbeam. From March to late November I ride 80-160K on weekends on the LeTour, my only geared bike. I have wanted to start doing Brevets. So here is where my problem lies: I am not quite solidified in riding style and haven’t ridden enough bikes to know what works best. I am, slowly, transitioning from being a “pusher” to more of a spinner, for the sake of my knees. I am looking to save up for a geared bike for rides greater than 150K but realize that with my budget it would take me 2-3 years to save what I would need to get a custom rando bike. What is the young cyclist to do? Jan, have you thought about an “ideal” progression? Do I need to spend a few more years on production bikes? 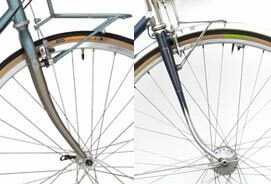 Or is it a good investment to live with what I have and save for a semi-custom (MAP) or custom (Rene Herse / JP Weigle). At what stage of life is it worth is to invest in a custom? That is a good question. In the past, it often was a leap of faith. I bought my first “high-quality” bike simply based on recommendations. It was a great racing bike, and things like wide, supple tires weren’t even on my radar then. Roger Baumann, the well-known randonneur, bought his first René Herse in 1952, also simply based on what he saw others ride. Today, it’s a bit harder, because there are many different schools of thought. Some will tell you that narrow tires are faster. Others claim that a bike without Grand Bois Hetres is hardly worth having. High- or low-trail geometry? Fenders that come off, or integrated designs? Battery or generator lights, or none at all? Front or rear load? In the end, you cannot try every permutation, and you have to evaluate each opinion as you form your own. If somebody’s reasoning makes sense and matches your experience, that is a good starting point. One advantage of many bikes is their high resale value. If you had a slightly used MAP, Weigle or Herse for sale, you probably would find many takers willing to pay most of what you paid, just so they don’t have to wait in the queue. Also, when choosing parts for a custom bike, Jan, you seem to tend towards a mix of current production and out of production parts. I can imagine that your Mafac brazed on center-pulls will last the life of the frame, but unless I am mistaken, derailleurs can wear out, or at least need to be re-built, correct? I’m sure a good custom builder could give advice in this regard, but how do you think about such out-of-production parts? When are out-of-production parts worthwhile and when are they not worth it? It all comes down to preference. The Mafac brakes, as you say, will last a lifetime, and then some. Derailleurs do wear out, and it makes sense to use current-production ones. On the other hand, keeping old bikes on the road isn’t that hard – parts are available, and while we shudder at the thought of $150 for a derailleur, the current Campagnolo offerings cost as much. However, I did not use the old bike to say that out-of-production parts are better. I used it so that it wouldn’t be seen as overt advertisement for one builder or another. I would dispute the characterization of almost any bike as ‘expensive’. A few years ago I gave up my car, and moved primarily to bicycles and public transit for transportation. I sold my car (which was considered an inexpensive car, I paid $22,000 for it, and sold it for about $15,000), and at about the same time bought a new bike – custom frame, all top notch components, primarily designed to be my commuter. Total cost for the bike came in at a little over $6,000. The bike serves the same function as the car did, and cost me less than 1/3. Yet for some reason the bike is considered expensive, and the car was inexpensive. My garage has two custom made bikes in it (along with a couple of mass produced bikes), and the total value of all four bikes is less than a new economy car would cost – very inexpensive in my estimation. I think the future is custom designed/mass produced. This is already happening in clothing. Used to be if you wanted a custom tailored shirt or pair of pants you went to a tailor and they measured and then made the clothes for you. You paid dearly for this service in part because the tailor had to take time away from the more cerebral talent – fitting and designing clothes – to perform the more rote function of cutting the fabric and stitching it all together. Reality is two pieces of fabric can only be stitched together to a certain level of perfection and there’s no reason a seamstress in Taiwan or China can’t do this just as well as an artisan tailor in the US or UK. The craft – which can’t necessarily be taught – is in the design and fitting and that’s what you should be paying for when going custom. The construction is a mechanical process which can be taught to a much wider workforce or even be completely automated. Now in clothing you have places like J Hilburn who will measure you, help you pick out the style/fabric, etc. but then have the garments made in Asia. The result is a custom shirt for only nominally more than what an off the rack shirt costs in many department stores. I have a couple of hand tailored dress shirts as well as a couple from J Hilburn and some off the shelf shirts from department stores. The only way you can tell the J Hilburn shirts from the fully custom shirt is to look at the label even though it cost quite a bit less. Both are noticeable improvements over the department store bought shirts and worth the extra money. It would be great to see this model applied to cycling. You could have someone design the bike for you – select the geometry, pick the tubing, figure out how to properly integrate all the components (fenders, racks, etc.) but then have the actual mitering, brazing and painting done in a more automated factory. Waterford, Seven and Cyfac already sort of do this though their manufacturing operations are still so small that there’s limited cost savings to be had (with Waterford being best in this regard, no doubt due to all those BMX frames they weld!) Beyond the cost savings, there’s the issue of expertise. Just because someone can design a great bike doesn’t also mean they’re going to be an expert in brazing, mitering, painting, etc. Indeed many artisan custom builders do farm out certain operations (such as painting) to people with greater expertise in those areas and also to save money (doesn’t make financial sense for many small builders to invest in a top quality paint set up). You can reduce costs AND simultaneously improve quality. The problem with a custom-designed / mass-produced product is that when you specialize in design and leave the production elsewhere you miss a whole lot of relevant information in the process. When a design has to be built and debugged by the designer you end up with a better design the next time. I agree that custom-designed / mass-produced has great potential, but only if the designer themselves has experience with every step of the process in creating the things which they have designed. Referring back to a previous post, is it simply economies of scale that bicycles have yet to have to be made in automated factories? Or is there something about the production of bicycles that is better suited to be “hand-made”? True and I’ve seen some examples of where this has happened with bike designers partnering with titanium fabricators not familiar with bikes. Ideally, you have a designer who knows the product and a manufacturer who specializes in bikes. An example would be Grant Petersen and Waterford working on custom Rivendell bikes. Grant isn’t a builder and has had only limited experience wielding a torch. You buy a Rivendell for Grant’s ideas on what a good bike should be and his experience in designing bikes. You don’t buy it because he’s a master craftsman who can braze a perfect joint. It’s also why a Rivendell and a Waterford are two totally different bikes even though they were probably brazed by the same people. My point is that the custom builder should spend their time focused on the customer and designing the ideal bike, not with more procedural manufacturing tasks that any reasonably skilled tradesmen can be taught to master. Doesn’t take a craftsman to miter a tube. Even brazing/welding isn’t that difficult if you have enough practice (and yes, I have tried it!) Biggest challenge is making sure your vendor is as committed to quality control as you are – no easy task when dealing with partners in Asia. Automation and economies of scale don’t always go hand in hand. Sometimes a human – even a well paid human – is less expensive than designing and building a machine for the task. Robots are expensive. Samuel – The Schwinn factory was as automated as any in that era. Schwinn failed because it was unable* to shift its automation expertise to the lighter tubing the market prefers. I am not certain there is a way to automate silver brazing. *Some people have argued Schwinn’s electrowelding could have worked with lighter tubing. Based on the last few articles, I’ve come to the conclusion that I don’t make enough money to read this blog. True poverty is a terrible thing, and makes affording any nice bike impossible. If you fall into that category, I hope your fortunes will improve. For most of us, how we spend our money is based on the choices we make. I bought my first high-end bike as a student, living with very, very little. I did not own a car, I did not eat out, and I saved for a long time. In the end, I found that it was worth the effort. Before, I had a mass-produced bike that was less fun to ride and cost more per mile, because too many parts wore out once I started riding seriously. The “high-end” bike lasted for 10 years of racing and more than 70,000 miles. I still have it, it’s still in great shape, but it no longer suits the riding I do. My quality bikes instilled in me the confidence to give up my car. Not having to pay for insurance, gas, maintenance, parking, license fees has me way ahead. It all comes down to priorities and life style choices. As with everything else in this life, there is no cheap access to the best. Mark, I hate to say it but I may be with you. I subscribed to Bicycle Quarterly but most of the reviews are for multi thousand dollar bikes that at the end are shown to have many flaws. These reviews are coming from what I believe are real experts but the comments scare the heck out of me as making an investment like this would be very significant. I liked the topic of this post and was hoping we would hear how you can spec out a bike for more reasonable fare but so far the comments seem to be it can’t be done and only a custom builder can build these bikes. My problem is that I wouldn’t know what to shoot for even if I could afford to go that route because when these bikes get reviewed in BQ, they usually display problems. Not confidence inspiring. It’s a simple fact that a well-riding bike costs a certain amount. And up to a point, extra money spent usually is worth it. I haven’t met many people who told me that they wish they had spent less on their bike, but I know a lot who wish they had spent more as they begin to replace parts that fail after only a year or two of riding. Your comments on Bicycle Quarterly’s bike tests highlighting problems with many bikes hit on an important subject. There are some truly great bikes out there, but “real world” bikes like the ones we usually test are still somewhat immature technology in this country. If you order an expensive racing bike, you can almost be sure that everything will work fine. Derailleurs and racing brakes are well through-out these days, and there are no fenders to come loose, no lights to fall off, and no front load to induce shimmy. It is a mature design, but of course, they also are lacking for “real-world” riding. We face a tough balance when testing a bike: On the one hand, we don’t want to be too harsh, and have minor problems put a customer off buying a bike, on the other hand, we don’t want customers to be disappointed when they buy a bike that is less than optimal. Most of all, we hope that the builders take our comments and improve their machines. I appreciate that you do not just focus on the pros during your reviews. I suspect for a certain segment of the market you can really impact a small builder’s backlog and it is something that you seem to take very seriously. The problem for me is that I really don’t want to be a bike mechanic or become an expert on every part on my bike and therefore need a resource like your blog and publication to steer me to the best bike. It seems that the very bikes we crave not only take a custom expert builder to execute but also take an owner willing to fix the items that don’t work once you take ownership. It is hard to think about a style of bike that has been around for decades as being so immature when it comes to reliable builds especially at the commitment to investment it takes. The style of bike itself is not immature. You can take a 1946 René Herse and ride PBP on it, as we did in 2003. Nothing fell off, nothing rattled, we had no mechanicals whatsoever. (We did have to lubricate the Cyclo derailleur once, but in 1946, there already was the Nivex that works for years without any attention.) Today, a new generation of builders on a different continent is interpreting this style of bike in their own way. They try to improve it, they incorporate new technology (generator hubs, etc. ), but it’s all still relatively new, and a definite design has not emerged yet. You also have to consider that people today are using their bikes much harder than people have in recent decades. I don’t mean that we are stronger, but that we ride faster on rough roads. Few rack trunks and clip-on lights would survive one of our typical rides. (In fact, in PBP, there were literally dozens of lights, bags, pumps and other “accessories” on the ground every time the road turned a bit rough.) So the bikes we test usually are better than most, but many aren’t flawless yet. May I just say that this whole thread is terrific? Thank you, Jan, for starting it with a thoughtful post. Oh, and Chris Lowe, do you by chance write for a living? I rode 15,000 miles in the past few years on bicycles that cost around $600 each, used (MSRP around $1200 for each). They weren’t steel, they weren’t custom built, nothing was “integrated” but they were great used bicycles that had me winning races, touring around the Great Lakes, playing bike polo, and commuting even throughout the snowy winters. Since I was new to cycling, these were the best bikes I had ever ridden and really enjoyed them. With the amount of riding I do now (~5000mi a year), I decided that a cheap steel frame with a new drivetrain was the way to go. I’ve done rides up to 158 miles now, and never felt held back by a cheap frame. The magical properties of steel/ti, low trail front ends, and planing are lost on me. If I can finish 150 mile ride at a good clip and still feel great, then I see no need to pursue a frame that literally costs 10x more than what I bought. I have no doubt that these bikes that cost many thousands of dollars are great bicycles, or possibly even the best ones out there. I just can’t imagine that the differences they provide are worth the premium price. If my cheap frame does 95% of what I could possibly need, that last 5% that costs thousands extra just isn’t rational to me. Andy, whatever the magic of high end cyclery, I think you’re right that in this era, there are quite a few extremely satisfying bicycles available at relatively low prices. All I can say about this discussion is that I am very ambivalent. I love my expensive custom loaded tourer, but equally I think there are many excellent production bikes, and I think the good ones are just as reliable and long lasting as more expensive custom bikes. I think custom bikes have two important advantages. The first is that the frame can be tailored exactly to your dimensions and your weight. Many production bikes are overbuilt because they were designed to survive overweight and inexpert riders. The result is a potentially stiff and unresponsive ride. The second advantage is that a custom bike allows you to get the kind of bike that you want, even though no large manufacturer makes such a bike. One example would be a 650B randonneur bike. Another would be my loaded tourer. I wanted a quite classic steel drop bar tourer with quality tubing, but with 26 inch wheels for comfort and off road capability, Son and Rohloff hubs, and Magura HS hydraulic rim brakes. Plus Nitto parts for the looks and quality. I think it meets both my functional and aesthetic requirements in minute detail, and there was no off the peg equivalent at all. Economically, it worked out as hardly more expensive than high end off the peg tourers from a European brand such as Idworx. That, of course, is not so surprising, given that large manufacturers my be able to get large discounts from the likes of Shimano, but have to pay pretty big margins to shops. Custom builders are direct sellers. So I think for expensive bikes, custom bikes are a good thing. Apart from fine tuning a frame, the important advantage of custom is that you can get a type of bike that you cannot get otherwise. This is all the more so since many large manufacturers focus their strategies on wannabee bikes like imitation Tour de France racers etc. On the other hand, a manufacturers like Surly or Fahrradmanufaktur in Germany show what can be done with sensible bikes for real riders. As it so happens, they don’t produce low trail bikes, but imagine if they did. As for parts, roughly the same applies. For really good loaded tourers, Rohloff hubs are the same for everyone. For derailleur bikes, we all rely mostly on Shimano, with the proviso that some of Shimano’s products are unfortunately becoming less attractive for serious randonneurs and loaded tourers: external bearings on cranksets have been disastrously unreliable, and integrated headset were less than ideal as well. The new generation XT rear hub has sacrificed reliability for a marginal weight reduction. However, most of all this is hardly an obstacle. There is a wide range of good hubs on the market, from pretty good mid range Shimano to various expensive alternatives. Even cheap square taper bottom brackets are excellent. Mid range Shimano road parts are still very good, and very good value. We have deeper drop alternative brakes from Tektro, Gearing is perhaps the hardest bit. Common cranksets have stupidly large rings, and many cassettes have uselessly small cogs (and too many cogs). Jan has filled the slot in the market for a high end low q crankset with a narrow enough bcd for an ultracompact double. A cheap low q 110/74 bcd crankset is still something the market needs. At the moment the Sugino DX and XD come closest, I believe, and they are available in more lengths than Jan’s wonderful Herse cranks. But really, think of a Surly Cross Check or Pacer frame, and how you could turn it into a really pretty good rando bike for only little money. To me, that is the more important challenge. Bu yes, I am saving for a really nice 650B custom bike…. As for utility bikes, I think what you need there depends very much on circumstances. I live in an area where bike theft is common. So for years I used a crude second hand Dutch bike with a coaster brake, until I got fed up two months ago, and bought a barely used second hand 1988 Koga Miyata town bike with elegant standard tubing etc for only 50 euros. I still need to replace some drivetrain parts (it has Positron gearing…), but with new Pasela’s the ride is swift. Willem, I think, I have my Surly Cross Check frame built up in a “rando style” similar to your description. In the end, this is similar to the Salsa bike Jan is comparing to the Singer, in price and in the issues Jan reports: The front rack and the fenders (Electra Ticino on my machine) aren’t as nicely placed as they would be on a constructeur bike, but they hold my luggage rsp. keep the water away. The XD cranks have a rather wider tread, but I don’t care. I have no durability concerns at all and I’m pretty confident that the Surly frame will not break – but it also doesn’t plane probably. The thick powdercoat paint is very durable and I much prefer it to the better looking wet paint on my previous bike for practical reasons. There are things that bother me a bit, like the front end geometry, the weight, and the toeclip overlap, but they don’t bother me enough (yet …) to spend more than five times as much on a custom frame. But to me the most important advantage of a custom frame is not the price, but the peace of mind a run-of-the-mill bike gives me. While I could afford to get a more expensive custom frame (btw. do you know if m-gineering is taking orders again? :), I really feel much more at ease with the Surly: I don’t need to worry too much when it’s parked outside while I’m at the movies. Nobody will be interested in stealing my XD cranks as they probably would be if I had Rene Herse cranks or so. I carry the bike down into the basement every day, and sometimes I hit the walls or doors when in a hurry: this is a no-brainer as I know the Surly can take a lot of abuse, and even if something really, really bad happens (a crash, a theft, …) it’s not such an emotional issue with a production bike as it would be with a custom bike, I think. I know many people have a “stealth bike” (there even was one in the lovely BQ “My favourite bike” section a while a go) because they feel similar. My stealth bike is my main bike. I guess what you are writing is what I was hoping we would find via Jan and BQ publication. I was hoping BQ would spec out a bike, that for most of us, would do a 90% job at some fraction of the cost of a full-on custom machine. I appreciate that there are always those that want and can afford / prioritize the absolute best of everything (Leica camera over Cannon for example) but unfortunately I am not in that position. I ordered BQ and many of their back issues hoping to find such a bike but this thread sort of confirms my own research results. For many who put on serious miles and write about these things, there is very little belief that an affordable option is in the market. More troubling is that they do not believe making such a bike is feasible. This is very disappointing because it means that this style of bike will always be a very niche bike with minimal market following. I really appreciate the thoughtful nature of this thread. No flaming, no finger pointing, just honest opinion by people who really put miles on their machines. We are working on an article on bikes outside the realm of what we usually test. One of them is a bike on a budget for a very tall rider. Like many others here I’ll probably never be able to afford a René Herse or Davidson, so I’m all in favor of Jan turning his excellent critical eye on a few less expensive bikes. I’ve been really intrigued by the design process and approach taken by Sean Virnig with Rawland’s two latest frames, the rSogn (for 650b up to 58mm) and Nordvinden (for 700c up to I think 38mm). Sean solicited and incorporated many suggestions for the design of both bikes from a group of knowledgable and experienced riders, including BQ frequent contributor Alex Wetmore, in an open, online design process. The relatively inexpensive (~$725) frames are being made in Taiwan, in the same factory that makes Surly frames, I believe. (Someone correct me if I’m wrong here.) Both frames are low-trail with light tubing, designed to easily accept racks and fenders. Seems to me these frames might fall into a sweet spot between “production” and “custom” frames. Starting from scratch it’ll still be tough to build one up with new high-quality components for less than $2,000. Hm, that’d be a great challenge for BQ to take on–build the best new BQ-style rando bike possible for $2,000. I got my first high-quality bike in my life after selling my motorcycle. The bike will “pay for itself” in two years just in what I’ll save on insurance. Not to mention the environmental and health benefits. The big difference between Kent and Jan is Kent is one of those people who think a bicycle can be “too nice to ride”. Jan (and Grant P. for that matter) are two of those people that think a bicycle can be “too nice not to ride”. Both positions are common. If you can’t bring yourself to use equipment that cost a lot, due to some kind of guilt or something, you should definitely avoid expensive stuff. An unused expensive bike is more of a waste than a well-used cheap bike. I did a ‘budget build’ this year that I’m quite proud of. I bought a 1984 model year, small-batch production racing bike of a well known brand. It came with parts that I knew were valuable on the second hand market. I took off all the parts that were not suitable for my ‘real world’ riding and sold them, replacing them with things that cost far less and work far better for my style of riding. I bought the bike for $600, made more than $600 on the parts I sold, and spent the equivalent of $400 for what I put on the bike (most of the parts were things I had on-hand). I now have a lugged steel road bike, American made, with standard diameter Reynolds 531, that has a useful compact double, reliable friction shifting, solid dual pivot brakes, top quality rims and tires, and takes my Loyal Designs handlebar bag with a nice Nitto rack and Berthoud decaleur. It will not take fenders with its 28mm tires, which is a major shortcoming. But for dry days, and all pavement, it is a spectacular road bike, and a very well-used member of my stable. It can be done. If you aren’t a mechanic and don’t know the value of things, it would be a much bigger challenge to do what I did. I think this consideration is often overlooked–that in any number of ways, purchasing one or two outstanding bicycles that are versatile, durable and low maintenance may have higher initial cost, but the total lifecycle cost can be WAY lower, plus the residual value after even decades of use can be quite high. Also, the fewer bikes one has while still meeting one’s riding needs, the less one becomes an indentured servant to one’s possessions. A couple of years ago, as my bicycle fleet was expanding to meet a variety of riding interests, it occurred to me that I was becoming enslaved by having too many bicycles, each with a requirement for maintenance, and that it would be liberating to instead own only one or two more versatile bikes. I made that change and it was in fact liberating–I got back a bunch of time. As much as I love my nicer bikes, a custom randonneur and a Rivendell, probably the best times I’ve ever had on a bike were touring and camping on my LHT this past summer in WA and OR. It’s built up with mid-range parts that are durable and function well enough for my needs. But you know, it’s not just about the bike, it’s also about the roads, the scenery, and the company (or solitude) that make for a memorable cycling experience. There are some less well known builders out there who are still perfecting their craft that can build a fairly nice custom bike. I have had a number of bikes built using builder like these. It comes with risk, though. On the 1st few, I knew to specify certain important design features but missed on others. Those were sold off as I learned from my mistakes. As time went on I learned what I wanted and what worked best and with help from publications like BQ. Recently I have had two frames built that were 95% as nice as the top builders at half the price. Sure the lugs may be simpler, the paint job less fancy, but the tubing is the same, the geometry is the same and the features nearly the same. I had to be very detailed in design requirements to get there. I had to learn things about tubing diameter/ wall thickness/taper/butting/lugs&dropouts. It’s actually been a fun journey. But boy did it take a long time to get to this point! Were it not for my particular circumstance, I would be riding a custom randonneur with Jan’s offerings for crankset, stem and decaleur. My circumstance is that I work at a bike shop with an ever replenishing supply of used bikes/parts. There is such an excess supply of little to unused bikes out there. None of them are perfect, but half the fun is endless tinkering/modifying to try to approach the performance of a well designed randonneur. And now that Jan’s research has suggested that there is little efficiency difference among 700c, 650b and 26″ wheels, and given that Jan now offers high quality 26″ tires, it’s high time for me to convert one of those old Japanese made mountain bikes into a gravel eating rando-gremlin. Poor man’s 650b! Paul, you are right: Used bikes and parts are the best bargains out there. I very much prefer a high-end used bike or part (in good condition) over a new, mediocre one. Paul, I suspect your perspective is what Kent was getting at. It may not even be an economic issue, but just being a tinkerer by trade or by nature. Nothing wrong with that!If you have a good old mountain bike that needs a home for a 6 foot rider let me know…. I’ll have to disagree just a bit, but first let me say that I’m very happy that there are small shop bike builders out there keeping the art of building bicycles alive. I feel that I will get much more enjoyment spending a thousand bucks on a good solid bike, and spending the remaining nine thousand bucks on touring trips than I would if I spent the whole wad on a bike. Enjoyment for me does not come from my bicycle, but where my bicycle takes me. There are countless Long Haul Truckers and Trek 520s out there circumnavigating the globe as we speak (or well write). And for me, spending the night out on a bike often involves hiding it in bushes. Touring involves letting my bike slide around on the slippery deck of a ferry, throwing it in the bed of some dude’s pick up truck, riding in the rain for days, exposing it to ocean spray or mountain mud or red Georgia clay. I’m just not comfortable doing that with a bike that cost more than the car I’m driving. You make a good point: If you feel uncomfortable riding an expensive bike, then it’s definitely not for you. However, it seems like you don’t mind driving a car that costs more than your bike. What if somebody cashes into it when it’s parked somewhere? Or worse, while you are driving it? In the latter case, you’d probably worry mostly about your own well-being. When riding a bike, I am mostly concerned about getting injured, not about putting a scratch on a nice bike. Material things, including very nice bikes, are not worth losing sleep over. If they get stolen, there is insurance. If they acquire some patina from being used, all the better! This is a good discussion. I don’t have much groundbreaking to add. But I did want to note that I own two bikes: a Surly LHT and a Mike Terraferma 650b. I baby neither one. The Terraferma is every bit as tough as the LHT– though it would not, because of the lightweight tubing, handle huge loads well. If I ever tour again I’d work very hard to go ultralight so I could take the Terraferma, not the LHT. The notion that a custom bike is somehow fragile or needs coddling is untrue, at least in the case of my Terraferma. I ride the crap out of it in all weather, on gravel, dirt, pavement, whatever. It’s a bike. I want to ride it and keep it in excellent mechanical condition and acceptable condition regarding appearance. A well made, custom rando bike should not be something one needs to worry about. I don’t really want to think about it at all, in fact. Was it cheap? Of course not, but I have no plans on replacing it; it should last many, many years. I use my LHT for commuting, errands, getting around town; I use the Terraferma for everything else. They are entirely different bikes in terms of ride. One more thing to note: Both were built with a mix of used and new parts. In fact, the most of the LHT, including the frame and fork, came used. The market for used parts on the internet is huge and with a little poking around one can find just about everything one would need for an excellent bike at very low cost. For example, I use Simplex Retrofriction shifters on both–both were purchased used for about $25. Of course, ride whatever you can or want to. No one should really care about what others ride. As Robert Pirsig pointed out, the word “quality” isn’t easy to define. Any attempt to pin it down with be controversial. 1. Durability is not necessarily related to cost. I’ve sold or had personal knowledge of hundreds of Surly bikes and frames. I recall seeing one failure, a broken dropout, and Surly replaced the frame immediately. I’ve also sold Rivendells, but in smaller quantities, and seen four of these fail, in different ways (Rivendell also replaced them or paid for repair). I love Rivendell, and I love Surly, but if my life was on the line to pick which brand makes more durable frames, I’d bet on Surly every time. I’d also point out that some riders ride with finesse and never break anything, while some people stomp everything until it breaks. Perhaps the historical Alex Singer customers tend to ride with more finesse than your average guy who buys a modern production bike. 2. You can put whatever fancy parts you want on a relatively “cheap” Surly frame. I personally find 99.9% of the durability and performance in mid-level Shimano parts. I have been let down by supposedly higher quality boutique brands of parts that cost 5-10 times as much as mid-level Shimano. I don’t bother with handmade or vintage parts, since those generally aren’t adequately obtainable. In my experience as a mechanic and bike shop person, parts almost never “wear out” (except tires, cogs, and chains). Usually some sort of mistake or accident or rider error can be shown to have caused the problem. Having more expensive parts doesn’t prevent any of those. 3. Jan has well-documented tastes for specific attributes on a bike. Obviously, few if any of those attributes will be available on any given production bike. My tastes are more forgiving, and lots of different bikes make me smile. 4. I have a custom touring bike from Curt Goodrich, which was ordered to be the approximate equivalent to the later-introduced Surly LHT with 26″ wheels. My Goodrich rides wonderfully. But I can’t say with any certainty that its durability or performance is better than that of the LHT. The candy apple red paint is prettier, but not nearly as tough as Surly powdercoat. Performance has more to do with me than with the frame. My Goodrich has expensive components, but I can’t tell by riding them! Some of my other bikes have modestly priced components that work as well. My opinion: Having a boutique-level bike instead of a high quality production model with mid-level parts is more about being a connoisseur who has very specific tastes that can’t possibly be addressed by mass production and/or having something unique that will impress your friends. The experience of cycling has very little to do with having this component or that component (provided both choices are functional). Jim, your perspective as a bike shop owner is a valuable datapoint. Of course, you also sell production bikes, so it’s good that you like them. When you mention the failures of Rivendells, do you mean the custom bikes made by Waterford/Joe Starck/Curt Goodrich/Mark Nobilette, or the production bikes made by Toyo (and others?)? Contrary to your experience, I have worn out most of the mid-level parts I have tried. Shimano A520 pedals are the most recent example. The bearings never were great, and even though I have several sets in rotation, they lasted less than 4 years. I am glad Shimano now offers the great “touring” style with better bearings. Compare that to 10 years on my Look pedals, and the bearings are still smooth. Similarly, IRD freewheels didn’t have the lifespan of the old Shimano Dura-Ace, but they also cost about a third (adjusted for inflation). The most expensive bike I’ve ever owned was low-end Peugeot in the 1980s. I had to replace every mechanical part except the front derailleur, the rear brake and the front wheel within 5000 km. Mid-level bikes have got a lot better, but I know too many people who had to replace Shimano 105 brake/shift-levers after only a season or two of riding. Thanks for bringing the REAL WORLD into the discussion and making a clear distinction between the connoisseur and the normal person, without offending the former or praising the later. The number of Rivendell failures are surprising. I think of frame quality or part quality as a hygiene factor (Maslov’s triangle). Without quality, the item is not considered for use at all. With quality, the item is considered for use and additional quality does not help your riding experience. You are right, the “real world” often is surprising. During the mountain bike boom of the late 1980s, I worked in a bike shop in Austin, TX. Back then, a budget mountain bike made from straight-gauge tubing with Shimano Exage parts (which were junk) cost $350, and the better model with double-butted tubing and Shimano Deore components (which were quite nice) cost $500. I tried to steer people to the better model, figuring that for most, it would be the last bike they needed to buy, and it would ride better, too. Most were reluctant to spend “that kind of money” on a bicycle. Finally, the owner took me aside and said: “Look, we are making more money on the cheaper model anyhow. How about you take care of repairs and assemblies, and let the other guys handle the sales?” The reality is that profit margins are much higher for production bikes, which is why custom bikes are viable only if sold directly from the maker. Similarly, for a shop, there usually is more profit in selling a budget tire than a Grand Bois tire, and a mid-line Shimano part than a a high-end part from a small maker. Jim – the difference I notice between a Surly and even a non-custom Rivendell is, as Willem and some of the others above point out the heavier tubing production bikes are forced to use given the U.S. market. At 6′ and 160 lbs (which quickly drops to 155 when I am on multi-day tours) I easily weigh 20 to 30 pounds less than most people a Surly my size is designed to accommodate. My custom bikes built with lighter tubing do have notably different and to me more pleasant ride handling characteristics than the (for me) overbuilt Surly’s, Somas and Rivendells. I honestly do not know how much better ride and handling a custom builder could wrest out of heavier gauge tubing for the heavier rider. As you say, the custom will usually look better and have subtle touches an off the shelf does not. You make a good point about heavier riders or those who prefer stiffer frames getting more satisfaction out of a production bike than those of us who prefer the “lively” feel of very lightweight tubing. Of course, if you work with a high-end production shop like Waterford, those limitations don’t apply. Their bikes are hand-made by skilled builders. Perhaps there is another way to get to the question of affordable Rando bikes. If you had to put together a bike from a non-custom builder, which frame and parts would you select? Mark – Already mentioned above are Bolder and the Box Dog Pelican. Both are batch made by a well regarded builder and come in at a good price. Personally I avoid groups in favor of mixing modern components with vintage pieces from my collection. For people who want all new components, Jim Thill’s middle of the line Shimano recommendation is sound. 1. Performance: I’m not a racer. I don’t care how many times I get passed by other cyclists. I commute to work. My bike is a tool, not a status symbol. I don’t need a bike that handles better – or even all that well; I don’t need a bike that climbs better – I can enjoy getting off and pushing up the occasional hill. 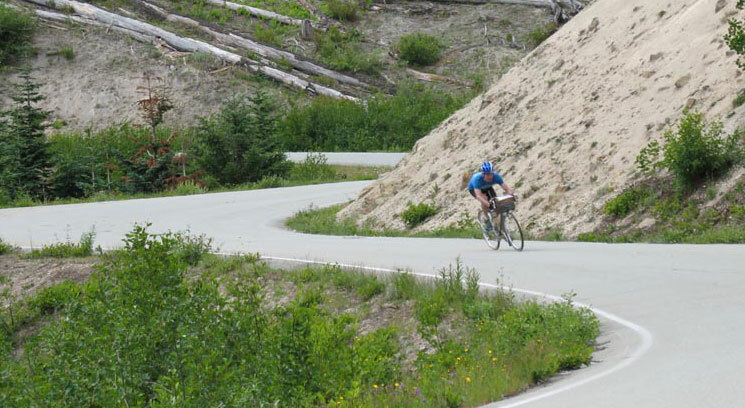 I don’t need a bike that descends better – every bike I’ve ever ridden goes fast enough downhill for me; I don’t need a bike to be less fatiguing to ride because I just don’t get that tired, because I’m not interested in getting anywhere fast. 2. Durability: no frame I’ve ever owned has broken. No component couldn’t be replaced, and when I replace cheap parts with cheap parts, they last long enough so that my investment is less over time than I’d be making to support better components. These days, all bikes are over-engineered and durable enough. If a frame ever breaks, I’ll spend $50 on a new one. 3. Aesthetics: to me, all bikes look pretty much the same. They are all beautiful in their own way. So my answer is: don’t care, don’t care, don’t care. Plus, when I take out my Raleigh Grand Prix, I know that every thief that passes by is looking at every other bike first. Heck, I could probably leave it unlocked downtown while I went to the movies and still find it there when I got back. And even if it is stolen, I can easily replace it for $50. If you spend $2000 on a bike, you’re constantly worried about its safety. Ian – Responding to your last sentence – actually, no I do not. My commuter is a custom. I ride it nearly every day and leave it at bike racks for long stretches of time. I take reasonable precautions, Which I would do in any event. No matter whether the bike is a custom or beater, if someone steals it, I have to walk or call a taxi. A burglar can steal, a fire or other disaster can destroy my possessions at my home. The fact does not lead me to buy wretched furnishings. I have my job and insurance. If my possessions including my bike are stolen, they can be replaced. In the meantime, I want to enjoy using them. I don’t think you’re the target audience for this blog post. Ian, you are my kind of cyclist! I agree that Surly and to some extent Rivendell probably emphasize pure strength and ruggedness over lightness or lively ride qualities. Whether they are “overbuilt” depends on the rider’s size and style. But the claim was that expensive bikes are more durable (and therefore cheaper in the long run), and I was simply observing that modestly priced Surly bikes tend to be exceedingly durable, often moreso than pricier bikes widely believed to be “higher quality”. I wouldn’t put them in the same class with Jan’s low end Peugeot that needed much repair in the 1980s. Those bikes were/are horrible. I’ve long felt that being a bike connoisseur and being a cyclist were two parallel but separate hobbies. There are obvious analogies in photography and food. Some of my favorite photographers use crummy cameras and some of my favorite cooks do not seem to require top-shelf ingredients. It really strikes me as a matter of diminishing returns and of the connoisseur. It’s true in any area where there is a rarefied upper echelon of product available. The difference between a $100 xmart bike and a $600 “entry level” bike is FAR greater than the difference between that $600 bike and a $2000 bike. While the connoisseur can continue to feel the difference up into the $6000 region, most can not. It’s true with speakers too. The audio reproduction of a pair of $200 speakers is more than sufficient for the average listener. Others will spend thousands and still hear artifacts. In the world of scotch, you couldn’t pay me to drink Glenlivet. I think Lagavulin and Ardbeg Uigeadail are “entry level” scotch though they cost around $100 a bottle which is already more than most would be willing to pay. As far as durability goes, I’m “car lite” and have mostly “entry level” bikes or used bikes and do not spend much time maintaining or repairing them. Yet beyond lubing a chain or checking tire pressure they are always ready to go. If someone is breaking a $1200 bike they are either doing something wrong or it is the inevitable problem of odds. Yes one can find examples of Surly bike frames failing. Pick any of your favorite frame artisans, keep them alive and in good health long enough to produce as many thousands of frames and you’d certainly find a similar failure rate. The one concession I’ll make is that when you go custom you should find yourself with a bike that is perfect for you. For You. By the same token, because it is perfect for you, it can not possibly be perfect for the theoretical “average consumer” who if male is between 5’8″ and 6′ tall, 150 to 210 pounds. The flip side of this is that it had better be the “last bike you’ll ever need” because if you should ever find yourself wanting to sell your bike you will have to find a buyer who’s every dimension is exactly the same as yours, plus they will need to value the same handling characteristics as you. One quick final aside. You will not find voids in the lugs of any currently mass produced bikes because you know good and well that no one has mass produced lugged frames in decades. I do not want to get into the custom/mass-market debate… even if it is the main point of this post. I have a family on one income, which though decent, is modest enough that a custom bike would not pass the scrutiny of ‘She, who must be obeyed’. I am interested in the comments on N.American weights, which are recently quite bloated, and the heavier tubing mass-manufacturers are using to satisfy the breakage (and lawsuits) this causes. Looking at building up my own budget randonneur, me at 172lbs, but 6’1″, I am more likely to see production frames bulked up to support 200lbs, making for a poor ride. The bike I have now is a poor randonneur, but uses much thinner tubing than most, making it not only livelier but also prettier: a 2006 Lemond Croix de Fer. My plan is to take a small-maker production frame like a Velo ORANGE Rando, or a Steel Wool Rover (specifically discouraged for riders over 180lbs), and throw on proven mass-market groupo and wheels. I won’t get to compare this to a custom frame built for me, but I expect to be very pleased. A lot of the discussion about components would be more accurate if applied to what was available in the 60s and 70s. I worked in a bike shop then and the low end stuff (plastic Simplex, Huret, Campy Valentino) was horrible, hard to adjust, and unreliable. If you wanted something to work well and last, you went with Campy Record. The cheap frames from France, England, and Italy were likewise absolute junk. I sometimes told customers (at least the larger ones who would probably break a lugged Raleigh Record) to go buy a Schwinn Varsity or Super Sport. Once the Japanese entered the market in the 70s, things began to improve and the inferior stuff was weeded out. Yes, there is some difference today across component groups, but even the low end Tiagra stuff will be perfectly adequate for someone riding 2 or 3 thousand miles a year. I know … I’ve used it. Wheel build quality and rim quality is where I see most problems in production bikes, rather than the frames or components. I do like and appreciate the best quality that is within someone’s budget, and have usually gone with higher end bikes/parts myself. To Paul the shop mechanic’s do-it-yourself post above, I’d ad that between Craig’s List and swap meets, accumulating a group of fine used components and a quality used frame that fits, at bargain prices is a highly satisfactory route to a great, durable ride that one can be proud of (or neurotic about). This is admittedly the slow method for creating your dream bike as opposed to paying thousands for instant gratification. Along with frame restoration and adding necessary braze-ons, creating your own, ideal bike this way is fun for those with somewhat smaller wallets and/or greater patience. The bike isn’t custom-made but it certainly can result in a very satifying, cost-effective, custom-assembled result. If you’re not a mechanic, get some advice from someone who is, discover what’s needed and start searching. The used or near-new compontents are out there and available, maybe just not immediately. This is how vintage bike restorers do it. However their projects can take years instead of months. Jan uses the word “optimal” a lot. He seems to feel that the only way a bike can be optimal is by being a hand built custom at great expense. Optimal is a slippery word which requires redefining with every use. Other than aesthetics I can’t see why many of the things he admires couldn’t and shouldn’t be available on a mass produced bike for a reasonable price. At least fenders, racks and lights made specifically to fit correctly. Their are several bikes knocking around the area tantalizingly close. Surly LHT and Cross Check, Salsa Cassaroll, Bianchi Volpe. what is lacking is conscientious refinement in the areas Jan has highlighted. I understand a manufacturer using off the shelf pieces on designs they are constantly changing but these bikes have all been in production for a while just as they are. The fact it hasn’t happened yet doesn’t mean it can’t. Maybe we should gift them a subscription to Bicycle Quarterly! Hi Jan: What an interesting discussion this is. I look upon the whole hand made bike situation as analogous to cars. Lots of folks drive Toyotas or Hondas or pick ups that work well as basic, comfortable tranportation. Some folks want more performance, and by mass produced versions of rally cars (Surabu WRX or Lancer EVO). Still others may buy a ‘mass produced’ Porsche or Jaguar, for a more scintillating driving experience. Then there are those who want a Ferrari, Aston Martin or Lamborghini. Great for sporty driving, but using them as a daily commuter, kid hauler or car pool ride will involve some compromises. I have owned a bike on the Ferrari end of the scle and at the time, it suited my purposes to a T. But now I am older, a lot slower, somewhat heavier and a Porsche suits me fine! Now, if I can just work out the money side of it!! The mid-range production car (Toyota, Honda, etc.) offers about the quality of a upper-tier production bike. On the other hand, in the car world, you simply cannot get a hand-made high-end machine like a custom bicycle. Even a Ferrari is mass-produced today, and even a Bentley uses mostly VW parts. The reason is that they would be totally unaffordable. With bicycles, the price spectrum is compressed. On the one hand, we pay more for mid-range bikes than we would if they were churned out by the millions in automated factories (as cars are). On the other hand, because we can buy high-end machines directly from makers who don’t earn much money, the upper-end bikes are a relative bargain. Imagine being able to buy a Ferrari for three times the price of a Honda Fit, or a Bugatti Veyron for 8x that price! There are indeed some pretty good sensible frames around, even if some refinement would still be possible. On the other hand, the last 10 % of ride quality is indeed probably only possible with a custom frame with a carefully chosen tubeset and dimensions that fit your body perfectly. Such bikes could also have elegant details, but those are not really necessary (even if I love them). As for build kit, I think modern medium range parts can go a long way on a relatively low budget. Here are two kits that would work well on a Surly Pacer or Cross Check. One is for a lighter rider, the other for a heavier one. wheels: 105 hubs and a lightish rim, handbuilt, 32/36 spokes. Or should there be a Shimano Ultegra/XT hub generator as standard? brakes: Shimano wide cantis, with Tektro levers (small ones on smaller frames). wheels: LX hubs on heavier rim, handbuilt, 32/36 spokes. Or should there be a Shimano Ultegra/XT hub generator as standard? There are no premium price parts in this list at all, but with properly built wheels the bike should perform well for a very long time. I like (ultra) compact doubles so that is what I gave this bike. Those who need a triple can convert at the cost of a small chainwheel and a longer bottom bracket. 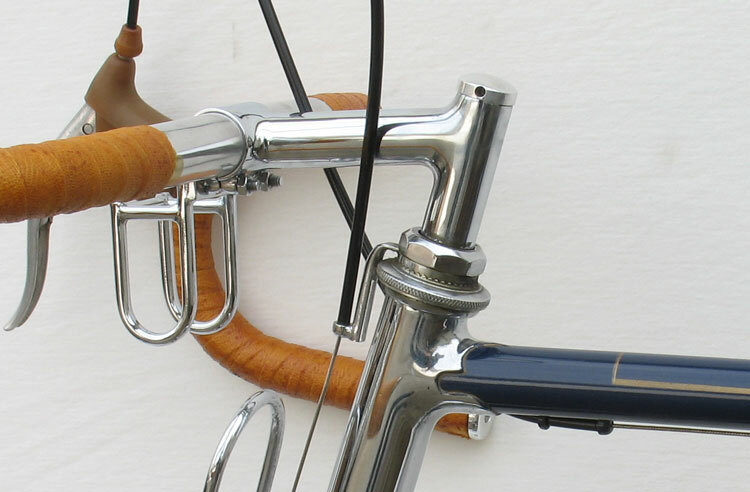 Moreover, both cranks and brake levers can be had in proper sizes. The frames I mentioned were chosen by way of illustration, and because they are good value and good quality. Alternatives do indeed exist. Jan’s thoughtful post was a timely one for me. I had just bought a pretty decent second hand steel cyclo cross bike from a former professional road racer, to serve as a test bed for what I wanted in a custom rando bike. With much experience in loaded touring but much less in fast rides on light bikes, I decided I needed to refine my taste first, and discover how important this kind of riding will be for me. Thus far, my biggest criticism of this bike is that the frame lacks magic, and that the gearing is too high. As I said earlier, we really need a cheap but decent ultra compact double (110 outer 74 inner) with a lowish q. Those are very good suggestions. How much would these bikes cost at retail prices, including the labor for the handbuilt wheels? I doubt you’d get either of those for less than $ 1500, once you include all the small parts and labor. I’d also like to suggest an upgrade to metal fenders, which provide better coverage and keep the water inside, rather than have it drip out on the sides and onto your feet. But of course, you cannot mount those easily on the frames, as they aren’t designed for direct fender mounting. I’d also like narrower crank tread (Q factor), which fortunately is easier to obtain. And of course, I also need lights and some way to carry my luggage. As you can see, we are quickly moving up in price, and suddenly, a Box Dog Pelican or a Boulder Bicycle is only 20% more. How is a Box Dog Pelican/Boulder only 20% more than $1500 if frame and fork already cost 1400 dollars? Once you make all the modifications, buy a hand-built set of wheels, add generator-powered lights and fenders, etc., the price of your Surly/Salsa/etc. is going to be much more than $ 1500. And at that point, starting from scratch with a dedicated frame may be only 20% more. You’re pretty much describing my commuter/tourer. I bought a complete CC in 2008. I switched the wheelset to a Mavic A719 on XT hubs in the rear and a DH3N80 on Open Pros in the front. Cyo Sport headlight, LinePlus rear light. Added a Jandd Standard rear rack (plus a Jandd front rack when I’m touring). Switched the cantis to Avid SD7 and the V-brake specific Tektro levers. SKS longboards. Randonneur Pro in 37-622. Added a 24t granny to the stock 48-36 crankset (required switching the bottom bracket and front derailleur) that I run with a 12-28 cassette. As a commuter, car replacement, tourer this bike is really awesome and probably would’ve cost me a bit over 1600 bucks had I done all the modifications at once and only used new parts. I plan on riding this bike for a long time. I’ve been riding for quite a few years and I have a Rene Herse/Boulder Bike with a lugged frame made of light weight tubing built by Waterford with classic Rene Herse geometry. It’s an expensive bike but less than 50% of the cost of a custom Rene Herse. I put good components on it. My guess is that I have maybe 90% of the ride quality (I deduct 10% for the fork blades which are not the thinner, Imperial ones) of the top of the line Rene Herse custom model. However, my experience of riding this bike back to back for a year with my Rivendell custom road bike which has (I guess) a bit heavier tubing and much higher trail is that the differences are slight without using a handle bar bag. In fact, if I were to ride where performance was important (something I don’t do that often, although I do like to ride fast) as long as it wasn’t going to rain (I live in Tucson and there are 330 days of sunshine a year, and when it rains during the monsoon it’s best to get off the road lickety-split, fenders or no fenders) I would ride the Rivendell which for me feels faster (if I were to be timed, both bikes would probably be the same). Also, unlike other riders, I’ve found that my low trail bike rides best for me without a bag at all. With a bag the steering is a bit sluggish, although as long as there’s not much weight in it I can ride without hands. The other thing that some people should watch out for is the increase tendency of shimmy. I had to learn to ride my low trail, thin tubed bike; once I did though, it became very nice. I should point out that my frame is 66cm which is a size that hasn’t been tested in Bike Quarterly. I would also like to say that my Rivendell Hunquapiller, which I’m sure has thicker tubes than the Rene Herse/Boulder Bike and Rivendell custom, rides wonderfully. It doesn’t feel slow. The other day I was riding up a steep hill on it and some other cyclists on carbon bikes did make it up to the top about 10 seconds or so ahead of me which probably wouldn’t of happened if I had been on one of the other two bikes, but then again, I have 50mm Schwalbe’s on it with Albatross bars. Going down hill we were all about even, but it wasn’t a race so who knows. In the end, through my personal experience, if I knew I was going to ride a lot of breve’s, then I would buy a semi custom low trail bike but I wouldn’t worry too much about the tubes (I might even go for slightly thicker ones to avoid shimmy). If I was going to do century/charity rides or general day rides with friends for that matter, I would get a bike with a geometry like a Rivendell. BTW, I haven’t noticed a problem with having a Nitto rear rack and a trunk type bag for my extra clothing with respect to handling. Yes, you have to get off the bike to get the stuff, but if I’m not racing, it’s not a big deal. Happy riding! Interesting. And I found almost no difference in handling with vs without a bag (test riding a low trail 650B bicycle designed with the tubing & geometry recommended here). I know, it’s really interesting because I didn’t suspect this would be the case; however, if the bag is lightly loaded the difference is slight. It’s only when I have a lot of stuff in there that riding no-handed isn’t possible. But I should say that when I don’t have the bag attached, I have a burrito wrap Rivendell style with an inner tube and tire iron strapped to the front rack so technically there still is some weight in the front. What is the trial of your Boulder? What type tubing (OS v Std) and wall thickness is used? Have you had shimmy problems? You stated “I had to learn to ride my low trail, thin tubed bike…” Can you provide some more information on this? Sure. The specifications are as follows: SA 72 deg, HA 73 deg, Rake 62mm, Trail 40.6mm, wheelbase 1057mm. The tubing is OS. Mike Kone of Rene Herse/Boulder Bikes told me that for a frame as large as mine he had to go with OS tubing in order to use the thin walled stuff. He went with the lightest tube set he could for a 66cm bike and although I can’t remember exactly, I’m pretty sure he used 747 for some of the tubes of the main triangle. people can’t adapt to these frame specifications (low trail thin walled tubes). I hope this wasn’t too confusing! Thanks for the reply. I understand it. Would appreciate it if we could discuss this off line through e-mails. Also interesting. I own a 52cm Rivendell Sam Hillborne. For me, it handles decidedly slower than the low trail 650B randonneur with standard diameter tubing I’ve tried. Could be because of my smaller size/ lighter weight. Well, the Hunquapillar is probably slower than my other two bikes, but it doesn’t feel slow or sluggish. Also, I have 50mm Schwalbe tires on it which I guess would have greater resistance than the Gran Bois tires I have on the Rene Herse/Boulder Bike. Since I’m tall and have really long legs and my bikes are so large, this could be the reason that I seem to be experiencing these bike differently than other riders. But again I think what’s important is that the differences I notice between the bike are fairly slight. They’re all nice to ride! A good friend of mine rides full brevet series on old rigid MTBs with flat bars, battery lights, and fenders, wearing a 20lb Camelbak full of water and other crap. He regularly outrides me and many other guys riding our latest rando wunderbikes. You are right, few things can trump horsepower (or Watts). But imagine what he could do on a nice bike! His “nice bike” is a lightweight titanium Habanero MTB. He regularly rides with, and keeps up with, other folks on road-racing and rando bikes. I don’t think he’d be significantly faster. My point is, I think it’s less important to have a fancy expensive custom bike than it is to simply put in the time and the miles to figure out what works best for you as a rider — to borrow Jan’s word, what is “optimal” for you. For some folks, that’s an old MTB, or a recycled Trek, or a recumbent, or a racing bike, or a custom whatever. It’s all good! On budget rando bikes… My favorite bike right now is based on a used 1992 Trek 400 frame that cost me about $100. I replaced the stock fork with a Kogswell conversion fork with 64mm of offset. Coupled with the frame’s 73º head angle and 650Bx35mm tires, the trail is right around 35mm. I selected this frame because I wanted parallel 73º angles (the seat tube angle is 73.5º but that’s close enough), decent tire clearance, and 9/6/9 standard diameter tubing — I wanted slightly heavier tubing to help reduce shimmy on the 61cm frame. I also had a 9/6/9 bike in the past that planed well for me. The bike sports 650B wheels, a Nitto front rack, a custom Zugster bag, and random MTB drivetrain parts (narrow Q hurts my knees). It weighs too much, but it was dirt cheap and is very enjoyable to ride both on and off road. I might braze some extra mounts onto the frame, then again I might not. I plan to get it powder coated once I finish dialing everything in — probably later next summer. Jim, your example shows that good used bikes can provide a great alternative. My Alex Singer was a similar project, albeit a bit more expensive.